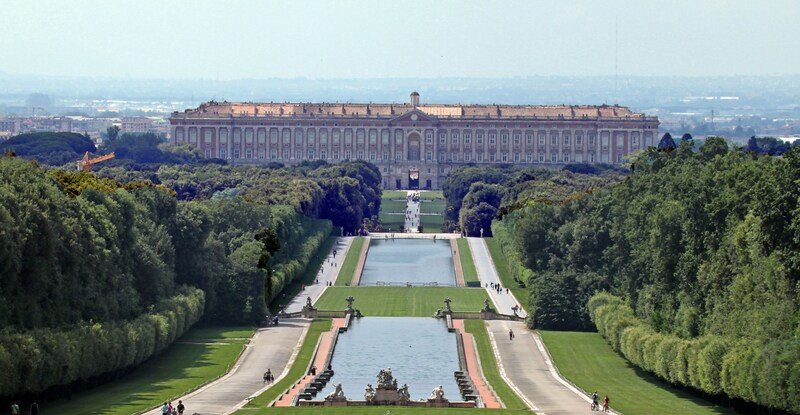 Accessible Caserta royal palace - ROME AND ITALY | TOURIST SERVICES IN ITALY! In 1750 Charles of Bourbon (1716-1788) decided to build this royal palace to make it the ideal centre of the newborn kingdom of Naples, free and not bound anymore to the spanish crown. The project for this immense building, which was going to rival with every other european royal residence, was assigned to the architect Luigi Vanvitelli (1700-1773), son of the famous painter Gaspar van Wittel, who had worked in Rome for pope Benedict XIV. The construction of the royal palace began formally on January 20th, 1752, date on which the first stone was laid, and went on at full speed until 1759, year in which Charles of Bourbon left Naples to reach Madrid after the death of the spanish king. After his departure, the construction works of the “palazzo nuovo” (the new palace, as it was known back then) slowed down considerably, so that at the death of Luigi Vanvitelli in 1773 they were still far from being completed. Carlo Vanvitelli, his son, and other architects who had been taught by Luigi Vanvitelli, eventually completed the royal palace in the next century. In 1997, the palace was designated a UNESCO World Heritage Site; its nomination described it as “the swan song of the spectacular art of the Baroque, from which it adopted all the features needed to create the illusions of multidirectional space”.In terms of volume, the Royal Palace of Caserta is the largest royal residence in the world with over 2 million and covering an area of about 235,000. The royal palace houses a museum that was opened in 1919, precisely when the palace stopped being part of the heritage of the royal house of Savoy and became property of the italian state; it also houses a theatre that was not included by Vanvitelli in the initial project and was probably built in 1756. The royal park was inspired by the most famous european royal palaces of the time, combining the italian renaissance style with the new french style of Versailles. Inside the park there’s a garden, commonly called “english garden”, made by John Andrew Graefer and commissioned by the queen Marie Caroline of Habsburg-Lorraine. The english garden seeks to imitate nature as there apparently isn’t any rational order and small rivers; ponds and ruins can be found there. The royal palace of Caserta is open daily, except on Tuesdays, from 8:00 to 19:30 and is fully accessible to people with disabilities.